“Who is that guy?” we asked ourselves upon arriving at Ici, the newest addition to Fort Greene’s Francophilic landscape. The host’s bald pate, Bond-villain mien, and suave, self-confident manner were all vaguely familiar—no surprise, considering the Underground Gourmet’s gluttonous, peripatetic ways and the turnover rate in New York’s restaurant industry. Over the course of dinner—a delicious moonlit repast in Ici’s peaceful, uncramped garden—we racked our brains. And then, finally, it came to us: We didn’t know him from eating out. We knew him from staying in. And so do you if you’ve ever watched The Restaurant. Before Laurent Saillard opened Ici with his wife, Catherine, he played another, splashier role—the haughty French general manager at Rocco’s and scourge of hapless waiters everywhere. After national exposure like that, it’s no wonder the Maître d’ Everyone Loved to Hate has shunned the spotlight and retreated to the leafy streets of Fort Greene, putting a river between himself and the specter of Rocco DiSpirito and his meatball-making mama. Clearly, this is the role Saillard was born to play. Ici is everything Rocco’s is not: civilized, charming, low-key, neighborhoody. 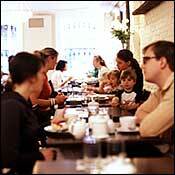 The dining room is an oasis of white-washed brick, the mom-and-pop service effortless and expert. And less than a month old, it’s already more polished than any new restaurant has a right to be. Before his brush with network fame, Saillard worked at Balthazar and Bouley, and it shows. Ici has the open-all-day, Everyman appeal of Balthazar and the streamlined style of Bouley, down to the basket of apples at the door. The all-French wine list is full of affordable bottles from lesser-known regions, and Saillard presents and pours them with a sommelier’s grace. He supervises the kitchen, too, which echoes Bouley’s starkly modern, ingredient-driven approach to the classic French tradition. The small dinner menu is gently priced to turn first-timers into regulars, and more seasonal than the typically formulaic New York French bistro. A cool sweet-pea purée is full of fresh spring flavor but light on the advertised “pineapple mint”; expertly fried soft-shell crab arrives on top of salty, buttery sautéed Bull’s-blood beet greens, an heirloom variety, which Laurent lets slip were “picked this morning.” The arugula’s local, too, and shows up in an Italian-accented salad with mushrooms, fennel, and shaved Grana Padano, minimally dressed with oil and lemon. The panzanella makes a stronger impression, with pungent white anchovies adding a layer of briny flavor to the croutons and tomatoes. No matter your position on carbs, don’t think about skipping the spaetzle, offered as an appetizer but also great as a side dish, as comforting as macaroni and cheese and nearly as rich. Crispy bits of braised dark-meat chicken and corn add textural contrast to the chewy, buttery pasta, all wearing a distinctly Eastern European chicken-fat sheen. It’s a savvy way to use up whatever remnants of Cloonshee Farm chicken don’t go into the entrée—a crisp-skinned, snowy-white-fleshed bone-in breast and thigh, and, with its fluffy lemon-zested couscous, a paragon of the regulation-bistro form. Ici’s version of skate, another bistro staple, is fiendishly rich, drenched in so much beurre noisette that if you close your eyes and breathe deep, you’ll smell croissant. Regardless, you’ll want to finish every bite, so tender it flakes off with the gentlest nudge of the fork, and every last toasted hazelnut too. Continuing in the proud Gallic tradition of cholesterolic excess, the nicely charred hanger steak satisfies, its dense wedges of crisp potato rösti soaking up the customary shallot-and-red-wine reduction. By comparison, a crispy fillet of mackerel is nearly dietetic (but no less tasty), served with a sprightly salad that harnesses the refreshing flavors of a Mexican pico de gallo. It’s only at dessert that the kitchen misfires. The French do many things well; the apple crumble, it seems, isn’t one of them. But the classic chocolate pot de crème is a much more fitting finale—especially when it’s savored with the rest of your wine on the metal porch swing outside the garden door, where the bilingual conversational hum rarely rises above a discreet peal of laughter. It’s rich and simple and straightforward, and, like Ici, infinitely more satisfying than an hour of reality TV. Ici, 246 DeKalb Avenue, Fort Greene, Brooklyn (718-789-2778). Lunch, noon to 4 p.m. Tuesday through Friday. Dinner, 5 to 10 p.m. Tuesday through Thursday, and Sunday; till 11 p.m. Friday and Saturday. Weekend brunch, 11 a.m. to 4 p.m. Appetizers, $5 to $8; entrées, $15 to $17.